The house by Castle Khislstein was among inhabitants known as Ullrich’s house. 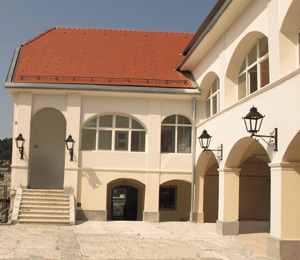 There are new administrative offices of Gorenjski Museum. In Ullrich’s House is also Vojnomir’s Hall, where our museum’s evenings and lectures take place. The castle and the house next to it was centuries more or less connected. We see them on Merianovi depiction of Kranj in the fourties of 17th century. Historical sources of 18th century witnessed two houses near the castle Khislstein. The castle was bought by Natalis Pagliaruzzi and in 1830 he also bought the house by the castle. In 1860 the house was bought by Jerome Ullrich, a native Czech, who married a Slovenian, Mary Stroj. Ullrich lived in the house in the first half of the 20th century, so there is nothing strange that it ‘s gotten a household name pr Ulrih . After I World War, the house was occupied by many families and single persons. 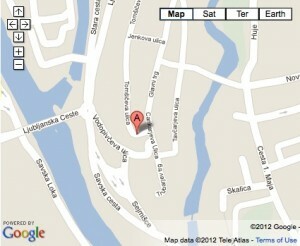 For some time there was the seat also the servicing company Kranj .